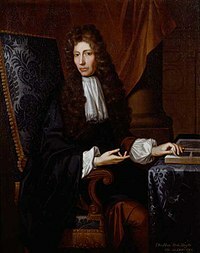 Eolaí Éireannach ab ea Robert Boyle (25 Eanáir 1627 - 30 Nollaig 1691), a thuill an teideal Athair na Ceimice de bharr a chuid oibre. Cháin Boyle teoiricí an ama ar dhamhna, agus thairg teoiric adamhach. Rinne Boyle turgnaimh chuimsitheacha le caidéil aeir chun airíonna folúis a scrúdú: thaispeáin sé nach bhforleathann fuaim i bhfolús, go dtiteann cleite níos tapa ann ná san aer, go múchtar coinneal ann, agus go bhfaigheann ainmhithe bás ann. D'fhorbair sé "dlí Boyle” na ngás (pV = tairiseach), is é sin go bhfuil brú (P) is toirt (V) an gháis comhréireach go hinbhéartach lena chéile ag teocht thairiseach. D'fhoilsigh Boyle an leabhar Sceptical Chymist (Ceimicí Amhrasach, 1661) agus bhunaigh sé an Cumann Ríoga an bhliain chéanna. Rugadh agus tógadh Boyle i gCaisleán Lios Móir i gContae Phort Láirge, agus fealsúnaí nádúrtha a bhí ann. Bhí Boyle ina stiúrthóir ar Chomhlacht na hlndia Thoir. Tugadh an leathanach seo cothrom le dáta an 30 Nollaig 2018 ag 21:02.